Not one to routinely quote biblical text, I have to admit that some of the stuff I was forced to memorize in religious school has stuck with me. Especially the one about beating one’s swords into plowshares. That seems like a good idea to me. And, obviously, I’m not alone. 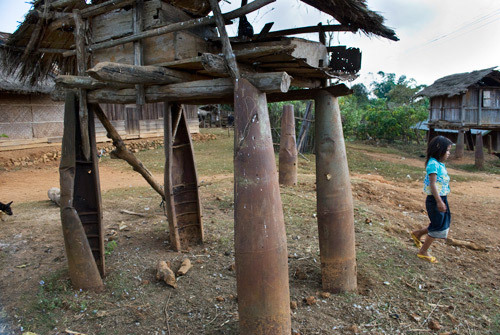 In Laos, possibly the most heavily bombed country in the world, remnants of the Viet Nam war are everywhere. Bomb casings, grenades, shrapnel and airplane parts litter the countryside. Over the past 40 years, according to Global Post, an entire industry has grown up around repurposing war’s metallic leftovers. Near a village called Ban Napia… villagers make 150,000 aluminum spoons from flares, fuses, fighter jets remnants and other war scrap. Ovens are dug into the packed earth surrounding village homes. 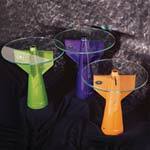 The metal is heated until it shimmers as liquid, then poured into perfectly shaped molds of dinner spoons. Each cooled utensil emerges with a little tail, a string of excess metal to be chopped off. If rough, the spoons are sanded, then gathered for sale to tourists, restaurateurs and local market vendors. The enterprise can be a risky business, though. Many unexploded bombs [known as UXO, for unexploded ordnance] lurk among the leftovers, and more than 50,000 people have been killed or maimed in incidents involving UXO since the end of the war. Global Post has an informative slide show demonstrating the many practical and creative ways that Laotians have put war scrap to use. 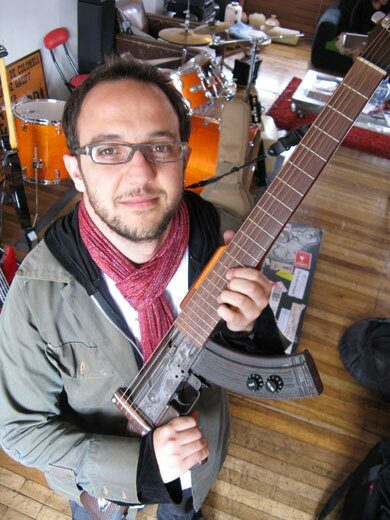 The result was an instrument he calls an “escopetarra,” a hybrid between the Spanish words for guitar and shotgun. It’s an instrument of peace, Lopez explains, that stands for a metamorphosis he hopes Columbia will undergo. Lopez’s creation, and his effort to share his message of transformation, have earned him some deserved recognition. In Colombia, he’s the United Nations official messenger of non-violence. He has produced 17 of the innovative instruments and has given them to Latin American rock stars and museums. One hangs in the United Nations building in New York. He also works to help rehabilitate traumatized soldiers. In Seattle’s Warren Magnuson Park, an array of structures look, at first glance, like killer-whale fins. Further research reveals that they’re actually the recycled diving-plane fins of 22 decommissioned U.S. Navy attack submarines. 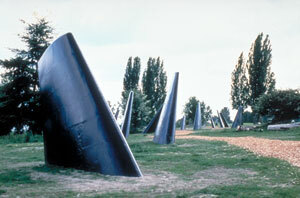 …the fins, each weighing 10,000 pounds, are placed at various angles and heights effectively creating a dynamic sense of movement, turning the earth at Magnuson Park into a substitute body of water. a few years ago. Similarly, MotoArt sells bomb tables, plus an array of picture frames, lamps and desk accessories fashioned from recycled airplane fuselages and pistons. None of these items comes cheap. Would it be too much of a stretch to say that the price tag could be viewed as commentary [perhaps unintended by the manufacturer] of the high cost—both financially and morally—of wars and weaponry? You can wear recycled weapons, too. An item called the “Peace Bomb Bracelet” is made from recycled bombs used in the Vietnam War. The idea behind the bracelets, says the manufacturer, Article 22, is to “raise awareness and tell the story of war and peace. Some of the proceeds from sales go to benefit the village in Laos where they are made. is a statement for or against war, or if it was just a guy being creative, but it’s worth noting. The dad in the photo apparently turned a discarded 500-lb. 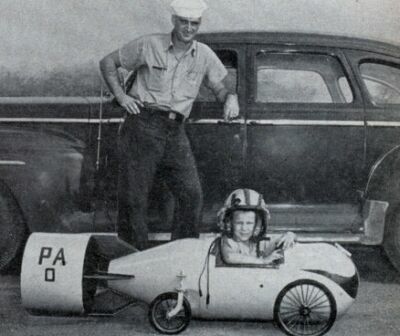 bomb into a space ship for his child. The message is mixed, and of a different, post-WWII era, of course, but it just shows, again, the many statements one can make by recycling the weapons of war.